No. 46229, having had its cylindrical smokebox replaced by a sloping smokebox at Tyseley, 6 May 2006, prior to the addition of its streamlined casing. Because of space considerations, all the streamlined locomotives of this class needed such smokeboxes. The London Midland and Scottish Railway (LMS) Coronation Class[a] is a class of express passenger steam locomotives designed by William Stanier. They were an enlarged and improved version of his previous design, the LMS Princess Royal Class. The locomotives were specifically designed for power as it was intended to use them on express services between London Euston and Glasgow Central; their duties were to include the hauling of a proposed non-stop express, subsequently named the Coronation Scot. The first ten locomotives of the Coronation class were built in a streamlined form in 1937 by the addition of a steel streamlined casing. Five of these ten were specifically set aside to pull the Coronation Scot. Although a later batch of five unstreamlined locomotives was produced in 1938, most of the ensuing Coronation class were outshopped as streamliners. Eventually, from 1944 to 1949, all new engines would be built in unstreamlined form and all the streamliners would have their casings removed. The very last of the 38 locomotives was completed in 1948. The Coronation class was probably painted in more styles of livery than any other engine class, seven in the LMS era up to 1947 and five more during the British Railways era from 1948 onwards. That does not mean that all 38 locomotives were painted in all these different styles; many were specific to just a few engines. The only style that all 38 bore was the British Railways lined Brunswick Green and the entire class was turned out thus between 1955 and 1958. It was customary on all British mainline journeys to change engines at convenient locations to avoid the lengthy process of re-coaling. The Coronation locomotives were therefore strategically stationed at key points between London and Glasgow and they would be assigned to the shed at that location. The chosen locations were at London (Camden shed), Crewe (Crewe North), Carlisle (Upperby) and Glasgow (Polmadie). It was only in the latter days of steam that the mix of shed assignments became more fluid. Whilst the Coronation class was represented at the 1948 British Railways locomotive exchange trials, designed to compare the performances of similar locomotives from all four of the pre-nationalised companies, the representative engine performed disastrously. Gone was any hint of the power that could be unleashed by these engines; instead, uncharacteristically low coal consumption was the target. If the trials were forgettable, other achievements of the class are certainly memorable. Firstly, No. 6220 Coronation held the British steam speed record between 1937 and 1939. Secondly, No. 6234 Duchess of Abercorn holds the record to this day for the greatest British power output to be officially recorded on an attached dynamometer car, achieved in 1939. Unfortunately the most memorable event in the history of the class was the Harrow and Wealdstone rail crash precipitated by 46242 City of Glasgow. 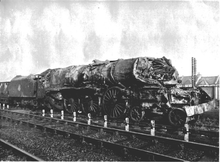 This was the second worst rail crash in British history, the death toll being 112. Although the prior introduction of the Princess Royal class had provided the London Midland and Scottish Railway (LMS) with more powerful locomotives to be used on the main line between London Euston and Glasgow Central, the board of directors were persuaded in 1936 that more such locomotives would be needed, particularly as they were being asked to approve the introduction of a new non-stop service between those cities, designated the Coronation Scot. Initially, the Chief Mechanical Engineer, William Stanier, planned to build five more Princess Royals, but the Chief Technical Assistant and Chief Draughtsman at the LMS Derby Works, Tom Coleman, argued that it would be preferable to design a new class of locomotive that was more powerful, more reliable and easier to maintain. Stanier was convinced and the drawing office commenced designing the new class. When Stanier was called on to perform an assignment in India, Coleman became responsible for most of the detailed design in his absence. Compared to the Princess Royal Class, there were important differences which would lead to an improved performance. Increased power was obtained by adopting a bigger boiler with greater steam-raising capacity; this included a firebox heating surface of 230 sq ft (21 m2) versus 217 sq ft, a flue heating surface of 2,577 sq ft (239.4 m2) versus 2,299 sq ft, superheater surface area of 830 sq ft (77 m2) (some sources say 822 sq ft) versus 598 sq ft and a grate area of 50 sq ft (4.6 m2) versus 45 sq ft. Also, the steam passages were better streamlined for greater efficiency. In order to allow higher speeds, the diameter of the driving wheels was increased to 6 ft 9 in (2.06 m) (from 6 ft 6in) and the cylinder diameters were increased by 1⁄4 in (6.4 mm). Finally, the outside cylinders were moved forward with rocking shafts operating the inside cylinders. Streamlined version NOT as originally built, as preserved. Just as the new design was approaching finalisation, the LMS marketing department created a problem that was close to being insurmountable. The London & North Eastern Railway (LNER) had recently introduced its streamlined Class A4 locomotive which had captured the imagination of the public, and the marketing department persuaded the board that the LMS's new locomotives should be streamlined too. This was problematic in that the new design was so large that it only just conformed to the maximum loading gauge for the main line; moreover, it was sufficiently heavy that it was close to the Civil Engineer's maximum weight limit. Nevertheless, Coleman managed to design a streamlined steel casing that hugged the locomotive so tightly that it could still meet the loading gauge. The casing weighed some 5 long tons (5.6 short tons; 5.1 t), but Coleman managed to save an equivalent weight in the locomotive itself. The casing was tested in a wind tunnel, and retained after it was found to be as good as other forms of streamlining. After introduction it was subsequently found that its aerodynamic form failed to disturb the air sufficiently to lift the exhaust from the chimney, thus obstructing the driver's vision with smoke. The first five locomotives, Nos. 6220–6224, were built in 1937 at the LMS Crewe Works at an average cost of £11,641 each. They were all intended to haul the Coronation Scot, so the locomotives and the special trainsets bore a common livery. The locomotives were streamlined and painted Caledonian Railway blue with silver horizontal lines along each side of the locomotive. The special trainsets that they hauled were painted the same shade of blue and the silver lining was repeated along each side of the coaches. In 1938 the second five locomotives of the class, Nos. 6225–6229 (named after Duchesses) were also built in streamlined form at an average cost of £11,323 each. They were painted in the same shade of crimson lake which had already been applied to the Princess Royal class; the same style of horizontal lining that had been a feature of the first five locomotives was continued, but in gilt. Although the crimson lake matched the standard LMS rolling stock, there was no attempt to apply the gilt lining along the sides of these coaches. A prototype trainset was built with such lining for exhibition in America, but it was never put into service due to the outbreak of the Second World War. Stanier, the designer of the locomotives, felt that the added weight and difficulty in maintenance due to the streamlining was too high a price to pay for the actual benefits gained at high speed. Therefore, in 1938 a third batch of five locomotives (again named after Duchesses) was built, Nos. 6230–6234, without streamlining at an average cost of £10,659 each. During 1939 and 1940, a fourth batch of ten locomotives (Nos. 6235–6244) was built in streamlined form commencing with No. 6235 City of Birmingham. The names of cities for the locomotives would seem to have been adopted because the LMS was fast running out of names of Duchesses. These locomotives cost an average of £10,659 for the first five and £10,838 each for the second five. The names of the cities in this batch were in strict alphabetical order. This came to an end when No. 6244 City of Leeds was patriotically renamed King George VI in 1941. The fifth batch, again named after cities, comprised four locomotives, Nos. 6245–6248. These engines were built during 1943 and the average cost was held to £10,908 due to the incorporation of recycled boilers. During the Second World War, the Materials Committee of the government tried to balance the needs for steel between civilian departments and the War Department when allocating those resources. Despite these constraints, the entire batch was still outshopped in streamlined form. The theme of cities continued into 1944 when another batch of four, Nos. 6249–6252, was built without streamlining. The cost of these locomotives averaged £11,664 each. A follow-up batch of three locomotives (Nos. 6253–6255) was built in 1946 and this batch attracted an inflationary average cost of £15,460 each. The problem of hanging smoke was addressed and smoke deflectors were now incorporated into the design. The final two locomotives were constructed to the modified design of George Ivatt who succeeded both Stanier, following his retirement, and Stanier's immediate successor Charles Fairburn, who unexpectedly died in office. The first, No. 6256 built in 1947, was the last of the class to be built before nationalisation and it was therefore named in honour of its original designer Sir William A. Stanier, F.R.S.. The unveiling of the nameplate was performed by Stanier himself. In 1948, the privately owned railways were nationalised and incorporated into British Railways. It was within this new regime that No. 46257 was completed - in common with other LMS locomotives, 40000 had been added to the original numbers. The spiralling costs after the Second World War, combined with the design changes, resulted in the individual cost of these locomotives escalating to £21,411. The lack of a handrail on the tender shows that this is an ex-streamlined Type A. The locomotive is No. 46225 Duchess of Gloucester photographed in 1961, so the table below shows that the tender is No. 9799. The original design of tender, which came to be known as Type 'A' was designed for the first ten streamlined locomotives. These were of welded tank construction and included side sheets extending from the rear of the tender, which had the effect of reducing drag from eddies between the tender and the leading coach. 28 of these were constructed to be coupled with all the 24 streamliners (Nos. 6220–6229 and Nos. 6235–6248) as well as four of the unstreamlined locomotives (Nos. 6249–6252). In practice, it would seem that the side sheets made it more difficult to access the water filler as well as the couplings. A second, more traditional design followed for the initial batch of five unstreamlined locomotives (Nos. 6230–6234). Again they were of welded tank construction, but lacked any of the streamlining add-ons. Even without the streamlining Type 'B' tenders were distinguishable from Type 'A' by having a slightly different profile at the front and steps and handrails at the rear. The third design, by George Ivatt, initially was Type 'C1' and it was paired with the three locomotives Nos. 6253–6255. It was partially riveted and resembled a Type 'A' at its front end and a Type 'B' at the rear. The design was quickly followed by Type 'C2', which differed from the 'C1' in that it had a lower front edge and was fitted with Timken roller bearings. Only two 'C2's were built and they were coupled to the last two of the class, Nos. 6256 and 6257. Whilst nearly fifteen of the tenders remained wedded to their original locomotives, others received new partners - the very first tender to be manufactured swapped partners seven times. After the Second World War, when the streamlined tenders were de-streamlined, it was difficult to spot any mismatches. The most readily visible mismatches were those of locomotives Nos. 6249–6252 where pre-produced Type 'A' streamlined tenders were married to unstreamlined locomotives. An unusual feature of all Coronation Class tenders was that they were fitted with a steam-operated coal pusher to bring the coal down to the firing plate. When this was in operation a plume of steam could be seen rising from the rear face of the coal bunker backwall. This equipment greatly helped the locomotive's fireman to meet the high demands for power during the non-stop run of 399 miles (642 km) between London Euston and Glasgow Central, when operating the Coronation Scot train. All LMS tenders were given their own unique identity numbers and they tended to be constructed in advance of the locomotives they would be paired with. Hence, they were made in four batches, Nos. 9703–9709, 9743–9752, 9798–9817 and 10622-10624. The following table lists the locomotives to which they were attached. Of note is the fact that locomotive No. 46221 had its tender (No.9816) withdrawn ahead of time in 1962; the locomotive was then paired to the Princess Royal tender No. 9359 until its withdrawal in May 1963. Following a report by George Ivatt in 1945, smoke deflectors were introduced due to drifting smoke obscuring the crew's forward vision. The first locomotive to be fitted with smoke deflectors from the outset was No. 6253 City of St. Albans in September 1946. All the following four locomotives included this feature. The first unstreamlined locomotive to be retrofitted was No. 6232 Duchess of Montrose in February 1945. George Ivatt's 1945 report also recommended the removal of all streamlining casings and they were removed from the fitted locomotives from 1946 onwards. It had been found to be of little value at speeds below 90 mph (140 km/h), and was unpopular with running shed employees as it caused difficulty of access for maintenance. The first step towards de-streamlining was carried out during the Second World War when many of the streamlined tenders had their side sheets cut away at the rear of the tender. Many photographs exist showing this measure. The removal of the streamlining proper commenced in April 1946 with No. 6235 City of Birmingham. All de-streamlining coincided with the fitting of smoke deflectors. No. 6243 City of Lancaster was renumbered as 46243 in April 1948 and as it was not de-streamlined until May 1949, when it became the only locomotive to carry its British Railways number while streamlined. Initially, locomotives that had previously been streamlined could be readily recognised by the sloping top to the front of their smokeboxes, as well as slightly smaller front-facing cab windows. In due course all were re-equipped with cylindrical smokeboxes and larger cab windows, often, but not necessarily, at the same time.The first locomotive to receive a cylindrical smokebox was No. 6226 Duchess of Norfolk in October 1952. The last one to retain the sloping top was 46246 City of Manchester which appeared with its new smokebox in May 1960. Even following the conversion to cylindrical smokeboxes, it was still possible to distinguish some non-streamliners from ex-streamliners. On the former (Nos. 46230-46234 and 46249-46252, but not 46253-46257) the running plates veered downwards at right angles to connect with the buffer beam in the style of the Princess Royal Class. The ex-streamliners did not have any such connection, except No.46242 City of Glasgow which was rebuilt in 1952 following a serious collision. The final two locomotives Nos. 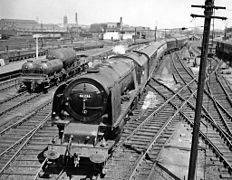 6256 and 46257 Sir William A. Stanier, F.R.S and City of Salford were given many new features. In order to raise the mileage between general overhauls from 70,000 to 100,000, measures were taken to decrease wear to the axle bearings and hornguides through the use of roller bearings and manganese steel linings. Other modifications included further superheating area, a redesigned rear frame and cast steel trailing truck, rocking grate, hopper ashpan and redesigned cab-sides. During the twentieth century, signals passed at danger (SPADs) were increasingly perceived as a significant danger to the public. Only the Great Western Railway truly accepted the challenge posed. Prior even to 1910, it commenced installing Automatic Train Control (ATC), a system where each distant signal was accompanied by a ramp between the tracks with which a shoe on the locomotive would make contact as it passed over it. When the signal denoted "clear", an electric current would pass through the ramp which was detected by the shoe, thereby sounding a bell in the cab. With the signal at danger, the electric current would be cut off and when the shoe detected this it would activate a warning horn. In later forms, the brakes would be applied should the driver fail to acknowledge the warning. In 1952, the UK's most disastrous SPAD ever occurred at Harrow and Wealdstone, in which No. 46242 City of Glasgow was severely damaged. The lack of an ATC system on most of Britain's railways was at last seen as an urgent issue. From 1956 the BR-designed Automatic Warning System (AWS) was installed. It was similar to ATC but relied on an induced magnetic field rather than an electric current and featured a visual indicator in the cab. The receiving system was installed on the Coronation class locomotives from 1959 onwards. The outward evidence of on-board AWS comprised a protective shield behind the front screw coupling, a box to house the necessary batteries immediately in front of the cab on the right-hand side and a cylindrical vacuum reservoir above the right-hand running plate. Before applying the top coats of paint, the LMS would apply a matt undercoat of shop grey. The first non-streamlined loco was fitted with mock-up nameplates and numbers for each of the first batch of locos which was then photographed to mimic each individual loco. Those temporary nameplates are now in the NRM's collection in York. The ensuing LMS top coats for the Coronation Class came in two basic colours during this period: Caledonian blue and crimson lake. Linings for streamliners involved the renowned 'speed whiskers' comprising stripes emerging from a fixed point in the lower centre of the front of the locomotive to run in parallel along the sides. Non-streamliners carried the standard LMS-style lining. The first five locomotives, Nos. 6220–6224, were painted in Caledonian blue with banding in silver-coloured aluminium paint. Wheels, lining to the edges of the bands, and the background to the chromium-plated namelates were painted in a darker blue, Navy or Prussian blue. The second and fourth batches of streamlined locomotives, Nos. 6225–6229 and 6235–6244, were painted in crimson lake, with banding in gold lined with vermilion and black. Nameplates had a black background. LMS shop grey was carried briefly in service on No. 6229 Duchess of Hamilton from 7 September 1938 until its return to Crewe Works later that year. It was then painted crimson lake and disguised as No. 6220, in preparation for the 1939 visit to the New York World's Fair. Lettering and numerals for both Caledonian blue and crimson lake liveries were in a newly created style of unshaded sans-serif. The non-streamlined Nos. 6230–6234 were painted in a special version of the standard crimson lake livery. The locomotives were lined out in gold bordered with fine red lines. Serif lettering and numerals in gold leaf and vermillion shading were applied. Handrails and sundry small external fittings were chrome-plated, as were the nameplates, which had a black background. Two unusual events have been recorded. Firstly, in 1940 No.6221 Queen Elizabeth had its Caledonian blue colour scheme replaced by the crimson lake, the only such instance. Secondly, it was often speculated that at some time in the two-year history of the Coronation Scot a crimson streamliner might have hauled the blue trainset. Such an event has, probably uniquely, been captured on film. No. 6233 Duchess of Sutherland in presevation turned out in LMS Black. Black was the overriding colour for this period, with one exception. Streamlined locomotives Nos. 6245–6248 were outshopped at Crewe in 1943 painted plain black. The following two batches, Nos. 6249–6255, constructed without streamlining, were also painted unlined black; the lettering and numerals on all these locomotives was in serif style coloured yellow with red shading. From 1946 onwards de-streamlined locomotives were mostly repainted in black with LMS-style lining. The lining comprised a broad maroon centre with fine straw yellow edging. Lettering and numbers were in a sans-serif Grotesque font, coloured yellow with an inner maroon line. By the end of 1947, 29 of the 37 locomotives were painted thus. The one exception to black was No. 6234 Duchess of Abercorn which in 1946 was painted in a blue-grey colour. This represented the proposed post-war livery and the lining, painted on one side of the locomotive only, comprised a pale straw yellow line along the running plate with yellow and black edging to cab and tender. Lettering and numerals used a sans-serif font. The following table lists the liveries carried by the Coronation class between June 1937 and December 1947. The blue-grey livery has never been authenticated in a colour photograph. Early in 1948, before the new liveries for the whole of British Railways had been decided upon, Nos. 46229, 46232 and 46236 were repainted in LMS-style lined black and No. 46257 was similarly turned out when constructed in July. Throughout 1948 and 1949 the English locomotives (now under the control of the London Midland Region of British Railways) were repainted in BR lined black. However, the Scottish locomotives based at Glasgow's Polmadie shed, which were under the control of the Scottish Region, were destined for a brighter future. Commencing in May 1948, seven of the class were called in to be painted in "experimental blue". So sudden was this decision that No. 46232, fresh in LMS-style lined black following its heavy general repair, was called back after a mere four days to be repainted blue. Around this time BR was also experimenting with various shades of green on the other regions. The Polmadie experiment was upheld by British Railways in 1949 when the somewhat darker BR standard blue was selected for all its large passenger locomotives, despite the fact that the Great Western Railway (GWR), the Southern Railway (SR) and the London & North Eastern Railway (LNER) had overwhelmingly painted their locomotives green (the LMS by contrast concentrating on crimson lake). Blue was subsequently carried by 27 of the 38 Coronation Class locomotives. The first two to be so painted, Nos. 46242 and 46243 were outshopped in the new colour when they received their heavy general repairs in May 1949. The blue livery, which was subsequently phased out, lasted until September 1955. British Railways undertook a massive programme to establish itself by repainting all its locomotives with their new BR numbers and replacing their previous corporate identity with its own. Gone were the tenders proclaiming the railway companies' logos, emblems and even coats of arms, to be replaced by the stark BRITISH RAILWAYS lettering. The enormity of this task meant that the necessary repainting was not necessarily carried out to coincide with an overall repaint. For the Coronation Class, all locomotives had been through this process by the end of 1948 except for Nos. 6223, 6238, 6248, 6250, and 6252–6255, a total of 29 locomotives. Only thirteen locomotives out of the 29 received new liveries to accompany their renumbering. Subsequently, in 1949 a crest was designed to replace the spartan BRITISH RAILWAYS logo. In turn, this would be replaced in 1956 by yet another design of crest. Preserved No. 46233 Duchess of Sutherland hauls a steam special gleaming in its BR Brunswick Green. In 1964, No. 46238 City of Carlisle shows off its coat of LMR Maroon. It also sports the yellow stripe. The decision to adopt blue as the standard colour was subsequently reversed and Brunswick green was introduced in November 1951 with No. 46232 Duchess of Montrose. Between October 1955 and December 1957, all 38 locomotives carried it concurrently, the only livery the entire class carried. In the late 1950s the decision was made that the London Midland Region's main line locomotives could carry the colour maroon. This permission did not extend to the Scottish Region whose locomotives remained green until withdrawal. The LMR maroon was carried on 16 locomotives from the late 1950s: Nos. 46225-6, 46228-9, 46236, 46238, 46240, 46243-48, 46251, 46254 and 46256. No. 46245 was the first, in December 1957; a further fifteen examples followed between May and November 1958. The style of lining varied: the first six repaints into maroon (including No. 46245) were lined out in the LMS style; the last ten received the BR style of lining as used on the standard green livery; No. 46247, originally lined in the LMS style, was given the BR style in July 1959; and by November 1961 those with the BR lining were repainted to match No. 46245. Because of insufficient clearance between the locomotives and the 25 kV overhead electric wires south of Crewe, the whole class was banned from operating under them with effect from 1 September 1964. To highlight this prohibition a yellow diagonal stripe was painted on the cab sides. This inability of the locomotives to operate on the line for which they were designed was crucial in the decision to withdraw the entire class. The table below lists the various liveries applied to the locomotives from 1 Jan 1948. Repaints in the same livery are not included. The LMS's code for a locomotive's shed was displayed on an oval plate on the smokebox door. The code "1B", above, relates to Camden shed. In 1940 some of the class were reallocated to Crewe North (5A) and Glasgow Polmadie (27A, 66A from 1950). As the numbers grew, Crewe North was generally the beneficiary, but in 1946 Carlisle Upperby (12B, 12A from 1958), received an initial allocation of six locomotives. At various times locomotives were also seconded to Liverpool Edge Hill (8A). A typical allocation of the 1950s was Camden 15, Crewe North 10, Polmadie 9 and Upperby 4. During the 1960s the installation of overhead electrification commenced between London Euston and both Liverpool Lime Street and Manchester Piccadilly. Phase 1 comprised electrification between Crewe and Liverpool and Manchester. Phase 2 involved the extension southwards from Crewe to London. The massive proportions of the Coronation Class resulted in their prohibition from operating under those wires. Camden's allocation was now run down (the remaining locomotives being transferred to nearby Willesden (1A)), whilst Polmadie's was dispensed with entirely. The bulk of the class was situated at either Crewe North or Carlisle, the Kingmoor shed (12A, 68A from 1958) now being used in addition to Upperby. There were wide variations in these histories. Six of the 1937–38 batches led a quiet life, being situated at Polmadie for the whole of their lives, apart from their initial spell at Camden. Others were moved from shed to shed for most of their lives, Nos. 6251 and 6252 being particularly well travelled. No. 6220 Coronation on its record breaking journey on 29 June 1937. Between 1937 and 1939, two significant records were set by locomotives of the Coronation class. Before the introduction of the Coronation Scot service, No. 6220 Coronation headed a special train of invited guests from London Euston to Crewe on 29 June 1937. After a fast but uneventful run the engine was accelerated up to high speed. Just south of Crewe, the train (disputably) achieved a speed of 114 miles per hour (183 km/h), narrowly beating the previous British record for a steam locomotive (held by the London and North Eastern Railway (LNER)). The brakes were applied far too late at such a speed and the result was that the train entered a series of crossover points at Crewe much too fast. Fortunately, Stanier had designed an inherently stable locomotive and both Coronation and its following train held the rails, although most of the crockery in the dining car was smashed, much to the consternation of the assembled guests In contrast to the LNER's record-breaking effort the previous year, when A4 Class No. 2512 had suffered severe damage when the centre cylinder's big end bearing failed, No.6220 was undamaged and was driven back to London the same day at an average speed of 79.9 miles per hour (128.6 km/h), maintaining over 100 mph for several miles. The LNER was to regain its ascendancy on 3 July 1938 when A4 Class No. 4468, Mallard regained the British and world records with a recorded maximum speed of 126 miles per hour (203 km/h). Following an earlier test using No. 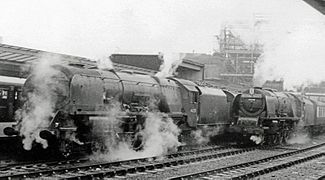 6234 Duchess of Abercorn which indicated that the locomotive's power was compromised by its single blastpipe, a double blastpipe and chimney were installed. On 26 February 1939, a retest was undertaken and No. 6234 hauled a train of 20 coaches, including a dynanometer car, from Crewe to Glasgow and back. Even though the load was 610 long tons (680 short tons; 620 t), the train was propelled up the climbs to the summits at Shap and Beattock at unprecedented speeds. Drawbar horsepower, representing the power conveyed directly to the 20 coach train, was frequently over 2,000 hp (1,500 kW) and a maximum of 2,511 hp (1,872 kW) was recorded. This remains the official British record for a steam locomotive to this day. Because there were unmeasured variables, the horsepower at the cylinders could only be estimated; Cecil J. Allen thought it to be 3,333 hp (2,485 kW) whilst O. S. Nock was more conservative at 3,209 hp (2,393 kW). This sustained power output could not be expected on day-to-day service as it was beyond the shovelling capacity of a single fireman, and two firemen were carried for this test run. Some seventeen years later, No. 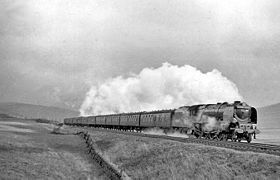 46225 Duchess of Gloucester, a virtually identical sister engine, was tested by British Railways on the open road on the Settle and Carlisle line. Again it was established that a continuous drawbar horsepower of 2,000 hp (1,500 kW) was readily sustainable. Strangely, the drawbar power output on the stationary test plant at Rugby could only be coaxed up to an absolute maximum of 1,710 hp (1,280 kW) which in retrospect casts doubt on the validity of the methodology. In May 1948 the BR Executive arranged a series of locomotive exchanges whereby each of the "Big Four" previously independent companies would submit its various locomotives for evaluation. It was intended that each locomotive would be tested not only on its own home territory, but on the tracks of its three other "rivals". The aim was to ascertain the best qualities of the competing locomotives in order to help design future locomotives. In that dynamometer cars were to accompany the test trains, whilst coal consumption was to be accurately measured, it was unclear whether the aim was to test the locomotives for power or for efficiency – the two are somewhat incompatible. No. 46236 City of Bradford at Paddington on the WR during the 1948 locomotive exchange trials. The locomotive classes were all pre-chosen by BR, but the various regions were free to choose, within certain parameters, which specific locomotives were to be represented. Tasked with supplying a suitable Coronation, the London Midland Region (LMR) selected No. 46236 City of Bradford. Regions were also free to choose their drivers. To drive the engine throughout, the LMR chose driver Byford from Camden shed who was seen to be sufficiently experienced. City of Bradford was then tested on its home ground between London Euston and Carlisle, on the Eastern Region (ER) between London Kings Cross and Leeds, on the Western Region (WR) between London Paddington and Plymouth, then finally on the Southern Region (SR) between London Waterloo and Exeter. The results showed that, compared with its peer locomotives, City of Bradford's coal consumption was the second lowest (and well below the third lowest), but its power output was well below any of its peers. In later years some insight has emerged concerning No. 46236's outings. On the WR, having arrived at Plymouth from Paddington, the dynamometer crew were amazed that such a large locomotive had consumed so little coal; on the undulating tracks of the SR west of Salisbury, it was alleged that coal consumption was held down by running gently uphill then racing downhill without any attempt to follow the timetable passing times. 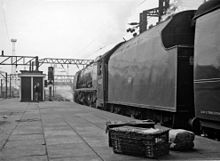 Additionally, a photograph of the locomotive leaving Kings Cross, bound for Leeds on the ER, shows the locomotive with so little coal on board that none could be seen even from a somewhat elevated vantage point. In other publications, driver Byford has been heavily criticised for his lacklustre driving  Certainly, Byford was so obsessed with minimising coal consumption that he never attempted to demonstrate any other facet of performance, but when coal consumption was being so accurately measured it was a reasonable assumption to draw that coal efficiency was the predominant requirement. Many years later, there was a degree of exoneration for driver Byford when the whole procedure was described as "the most inconsequential and unrepresentative series of competitive trials ever to be held on the railways of Great Britain". No. 6251 City of Nottingham showing the damage to its front end following the 1948 collision at Winsford. No. 46242 City of Glasgow after the 1952 Harrow and Wealdstone collision. Despite the extensive damage it was subsequently repaired and returned to service. On 21 July 1945, locomotive No. 6231 Duchess of Atholl was hauling an express passenger train which overran signals and collided with a freight train that was being shunted at Ecclefechan, Dumfriesshire. Two people were killed and three were injured. On 21 July 1947, locomotive No. 6244 King George VI was derailed at 60 mph (97 km/h) near Polesworth, Warwickshire due to the poor state of the track following the years of neglect throughout the Second World War. Coaches piled up behind it and five passengers were killed and 64 injured. On 19 November 1951 No. 46252 City of Leicester, whilst traversing from the fast line to the slow, was derailed at almost the same spot. This time there was no pile-up and no serious injury. On 17 April 1948, locomotive No. 6251 City of Nottingham was hauling a mail train which was in a rear-end collision with a passenger train at Winsford, Cheshire. In the first major accident for the newly formed British Railways, 24 people were killed and thirty injured. On 25 April 1949, locomotive No. 46230 Duchess of Buccleuch was hauling a passenger train that overran a signal and was derailed at Douglas Park Signal Box, Motherwell, Lanarkshire. The signalman was suspected of having deliberately moved points under the train. On 8 October 1952, locomotive No. 46242 City of Glasgow was hauling an express passenger train when it overran signals and crashed into a local passenger train at Harrow and Wealdstone, Middlesex. Another express passenger train ran into the wreckage. In the second deadliest railway accident in the United Kingdom, 102 people were killed at the scene and 10 more died later from their injuries; no fewer than 340 people were injured. On 3 February 1954, locomotive No. 46250 City of Lichfield was hauling a passenger train that was derailed inside Watford Tunnel, Hertfordshire due to a broken rail. The rear three carriages became divided from the train at Watford Junction station, with one of them ending up on the platform. Fifteen people were injured. There were three instances of firebox crown collapse, resulting in boiler explosions. No. 6224 Princess Alexandra suffered a severe failure at Craigenhill on 10 September 1940 due to the inexperience of the crew (who both perished). The same locomotive suffered a similar failure on 7 March 1948 at Lamington due to dirty and malfunctioning water gauge glasses. The third incident occurred as No. 46238 City of Carlisle was passing Bletchley on 24 January 1962 - this was attributed to faulty design of the water gauge glasses. The London Midland Region, compared with some of the other Regions, was slow to discard its "Big Engines". By a matter of a few days, the Western Region had managed to withdraw the whole of its King Class locomotives before the Coronation Class lost its first. The beginning of the end occurred late in December 1962 when it was deemed uneconomic to proceed with major repairs required by three locomotives. Nos. 46227, 46231 and 46232 were therefore summarily withdrawn. Nos. 46234, 46246 and 46253 followed the next month and throughout 1963 the entire initial batch, Nos. 46220-46224, was withdrawn along with Nos. 46230, 46242, 46247, 46249 and 46252. These withdrawals meant that by the New Year of 1964, there were only 22 of the class remaining. Nos. 46229, 46233 and 46236 followed in early 1964, although two of this group - No. 46229 Duchess of Hamilton and No. 46233 Duchess of Sutherland - were destined for preservation. Attempts were now made to find a role for the remaining 19 locomotives. By now many had been relegated to hauling trains in what were once seen as remote outposts of the LMS. Often they were reduced to pulling stopping trains, empty stock trains, or even goods trains. Only one realistic mainline role was contemplated: to replace the Scottish Region A4 Class on the testing route between Edinburgh Waverley and Aberdeen. This idea was discarded largely because it would be excessively problematic to train the A4 crews to operate the Coronations. With no credible role, only one option remained: in July 1964 it was resolved that the remaining 19 locomotives were to be withdrawn from 12 September. Of the 38 original members of the Coronation Class, only the following three locomotives have been preserved, albeit in very different ways. Two of the three preserved engines have even run on the mainline in preservation, these being 46229 & 46233. As of 2019, only 6233 is operational and has a valid main line certificate. No. 6229 on display at York after re-streamlining at Tyseley. Butlin's, the holiday camp giant purchased No. 46229 Duchess of Hamilton following the withdrawal of this locomotive in February 1964 and it was put on display at the Minehead holiday camp. In 1975, following a slow deterioration due to the Minehead's salty atmosphere and the looming maintenance costs, Butlin's signed a twenty-year loan agreement for it to be taken under the wing of the National Railway Museum. In 1976, following a cosmetic overhaul, No. 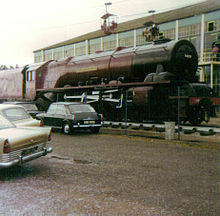 46229 was put on static display in the museum's York premises. In due course a fundraising appeal allowed an overhaul to take place as a precursor to letting the locomotive operate on the national rail network once more. In April 1980 the locomotive again took to the rails and thereafter was employed in hauling many enthusiasts' trains. After a substantial overhaul, the Duchess was declared fit in 1990 to continue working on the national network and at the same time the museum purchased it outright from Butlins. In 1998, however, the locomotive returned to static display at the National Railway Museum in York. Following a successful appeal run by Steam Railway magazine, it was decided to re-streamline No. 46229. The locomotive was moved to Tyseley Locomotive Works, for the work to be carried out. The project was completed in 2009, and the locomotive returned to York in May, now wearing its crimson streamlining and pre-war number 6229. No. 6233 before its 2010-2012 overhaul. This livery is from 1938. The locomotive still wore this livery in 1946 when the smoke deflectors were added. No. 46233 Duchess of Sutherland after its 2010-2012 overhaul. This could well be a scene from the early 1950s. No. 46233, which was withdrawn at the same time as No. 46229, was also purchased by Butlin's and it was displayed at its holiday camp at Ayr, although - like No. 6229 Duchess of Hamilton at Minehead - it was stripped of its smoke deflectors and painted in pseudo-LMS livery. By 1971 it had similarly deteriorated due to the salty seaside air and was in need of expensive maintenance. It was rescued by Alan Bloom, owner of Norfolk-based "Bloom's of Bressingham" nurseries; he had already taken over the Royal Scot Class No. 6100 from Butlin's Skegness holiday camp. In March 1971 No. 46233 was taken by rail and road to Bressingham on permanent loan. Over the course of the next few years, Bloom spent some £16,000 restoring the locomotive (along with some 20,000 man hours) and in May 1974 it was restored to steam once more. Unfortunately, as 1976 progressed it was discovered that No. 46233 would require a new firebox tubeplate at a projected cost of £12,000. Bloom was not prepared to spend further money at this time and the engine became a static exhibit at Bressingham. In 1989 Bloom bought the locomotive outright. During 1993 it was moved temporarily to the East Lancashire Railway near Manchester and whilst there an exercise was undertaken to establish what repairs were necessary and how much they would cost. It was found that the extensive list amounted to £162,000 and no business plan could be found that would support such expenditure. In November 1995 the Princess Royal Class Locomotive Trust purchased the locomotive for £200,000 (through a third party) and the following February it was transferred to the Trust's premises at the Midland Railway in Butterley,Derbyshire. In 1998, funded by public donation and the Heritage Lottery Fund, the third party purchaser was paid off and the money was now available to restore the locomotive. The work was carried out at the railway workshops at Swanwick Junction and in July 2001 the restored locomotive was allowed a trial run on the national rail network, where it promptly broke down and had to be towed home. With the fault fixed, No. 46233 now started to generate income by hauling enthusiasts' trains, as well as the Royal Train on two occasions. Following another overhaul commencing in 2010, the locomotive resumed its steaming duties in 2012. As at October 2016, it is still owned by the Princess Royal Class Locomotive Trust and still pulling enthusiasts' specials. No. 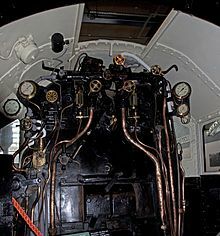 46235 displaying the complex interior of its cab. No. 46235 City of Birmingham in its Thinktank setting. The locomotive received its official naming ceremony in March 1945, although it was well over five years old at the time. Alderman Wiggins-Davies performed the ceremony at the back end of Birmingham New Street station as the locomotive was too large to be accommodated within the main part of the station. 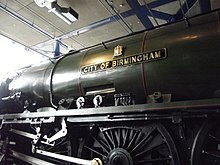 The city's love for its eponymous locomotive was borne out when, in 1953, Birmingham's Museum of Science and Industry determined that when the opportunity arose it would like to acquire No. 46235. When the locomotive was withdrawn in October 1964, the opportunity was taken by the museum to purchase it. After successive spells at Crewe Works, Nuneaton, Crewe again (for cosmetic overhaul), Saltley depot and the Birmingham Lawley Street container terminal,the locomotive was finally moved to the museum in May 1966. At that time the building was still under construction and the building was completed until 1972. In 1997 Birmingham City Council decided to close the museum and to construct the brand new ThinkTank museum (since re-christened Thinktank, Birmingham Science Museum) in nearby Digbeth. In 2001 the locomotive was moved to the Thinktank where it remains as at September 2017. It differs significantly from the other two preserved locomotives in that it represents the only untouched example of a British Railways Coronation locomotive. The following table lists the chronology of major events for the entire class. De-streamlining took several weeks, so the date for modifications has been taken as the date when the locomotive was returned to service. Entries listed as "Current" are valid as at December 2016. 6220 46220 Coronation Jun 1937 Str. Dec 1944 Nov 1946 Nov 1946 Mar 1957 Apr 1963 1937:Set speed record of 114 mph (183 km/h). 6224 46224 Princess Alexandra Jul 1937 Str. May 1940 Jun 1946 Jun 1946 Oct 1954 Oct 1963 1940: Involved in firebox collapse at Craigenhill. 6250 46250 City of Lichfield May 1944 Conv. New — Mar 1946 — Oct 1964 1944: Built with streamlined tender. 6251 46251 City of Nottingham Jun 1944 Conv. New — Aug 1946 — Oct 1964 1944: Built with streamlined tender. 1948: Involved in the collision at Winsford. Built post LMS 46257 City of Salford May 1948 Conv. New — New — Oct 1964 1947: Design modified by Ivatt. No 46240 City of Coventry on the approaches to Carlisle Citadel Station in 1957. No. 46227 Duchess of Devonshire working hard to climb to Beattock Summit in 1957. No. 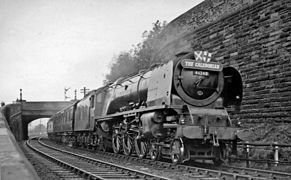 46236 City of Bradford approaching Crewe in 1957..
Coronation Class locos changing over at Carlisle on the southbound Royal Scot in 1958. No. 46221 Queen Elizabeth (left) and No. 46240 City of Coventry with headboard ready to climb Shap. ^ Evans 1961, Chapter 5. ^ Roden 2008, pp. 18–19. ^ a b Bellwood & Jenkinson 1976, p. 73. ^ Haresnape 1974, Section 11. ^ Roden 2008, pp. 23–25. ^ a b Haresnape 1989, p. 123. ^ a b Peacock 1951, pp. 606-61, Paper 506. ^ Bellwood & Jenkinson 1976, pp. 73–74. ^ Baker 2010, pp. 76,80,82,86 and 88. ^ Baker 2010, pp. 92,94,98,100 and 102. ^ Roden 2008, p. 49. ^ Marsh 2006, pp. 27–29. ^ Baker 2010, pp. 106,110,112,116 and 118. ^ Baker 2010, pp. 120,124,130,134,136,138, 142,144,148 and 150. ^ Baker 2010, p. 150. ^ Baker 2010, pp. 156,162,166 and 168. ^ Howlett 1994, pp. 523-44. ^ Jenkinson 1982, Plates 135,144 and 148. ^ Baker 2010, pp. 172,174,178 and 182. ^ Baker 2010, pp. 186 and 190. ^ Roden 2008, p. 59. ^ a b c d Roden 2008, p. 64. ^ Banks 1990, p. 7. ^ Banks 1990, pp. 8 and 189. ^ Baker 2010, pp. 196 and 200. ^ a b c d e f g h Jenkinson 1982, Tender Designs and Changes. ^ Jenkinson 1982, Plate 168. ^ Jenkinson 1982, Plates 122 and 197. ^ The Engineer 1939, p. 466, 3 diagrams and plan..
^ Jenkinson 1982, Notes to Nos. 6220-46257. ^ Jenkinson 1982, Notes to No. 6221. ^ a b c d e f Baker 2010, p. 59. ^ a b Roden 2008, pp. 38–42. ^ Baker 2010, pp. 59 and 66. ^ Jenkinson 1982, Plate 77. ^ Jenkinson 1982, Plates 34,96,114,125 and 144. ^ Talbot 2011, pp. 100–104 and 106, Plates 147–150,154–157 and 159. ^ Banks 1990, p. 148. ^ Baker 2010, pp. 56 and 62. ^ Jenkinson 1982, Plate 86. ^ Jenkinson 1982, Plates 17,41 and 127. ^ Jenkinson 1982, Plate 56. ^ Jenkinson 1982, Plate 3. ^ a b Jenkinson 1982, Plates 120 and 123. ^ Nock 1984, p. 146. ^ Rolt 1955, pp. 202–203. ^ Baker 2010, p. 69. ^ a b c d Haresnape 1989, p. 115. ^ Haresnape 1989, p. 125. ^ Talbot 2002, p. 60, plate 77. ^ Jennison et al. 2009, p. 19. ^ Talbot 2011, p. 50. ^ a b Haresnape 1989, p. 124. ^ a b c Baker 2010, p. 64. ^ Talbot 2011, p. 32, Plate 36. ^ a b Haresnape 1989, p. 138. ^ Haresnape 1989, pp. 140–141. ^ Hunt et al. 2008, pp. 105,143 and 166. ^ Jennison et al. 2009, p. 49. ^ Binns 1988, p. 18. ^ Haresnape 1989, p. 139. ^ Jenkinson 1982, Plate 73. ^ a b Baker 2010, pp. 64 and 76–200. ^ Hunt et al. 2008, pp. 143,148,150 and 166. ^ Jennison et al. 2009, p. 51. ^ Baker 2010, pp. 64 and 112. ^ Banks 1990, Rear jacket. ^ Baker 2010, pp. 64,144 and 148. ^ Baker 2010, pp. 64 and 186. ^ Banks 1990, pp. 147–148. ^ Jackson 2013, Chapter 6:In Search of an Identity. ^ a b Hunt et al. 2008, p. 153. ^ a b c d Hunt et al. 2008, p. 157. ^ Hunt et al. 2008, p. 136. ^ Jennison et al. 2009, p. 118. ^ Jenkinson 1982, Plate 95. ^ a b Baker 2010, p. 49. ^ Jenkinson 1982, Summary of 'Duchess' 4-6-2 Allocation at Depots as at Autumn of the Years shown below. ^ "Your New Railway" (PDF). British Railways Board. 1966. pp. 7–9. ^ a b c d e Baker 2010, pp. 76–200. ^ Nock 1971, pp. 163–164. ^ a b Nock 1984, pp. 82–83. ^ a b Roden 2008, pp. 26–31. ^ Tuplin 1969, p. 130-131. ^ a b Hollingsworth 1982, p. 152. ^ Nock 1984, p. 86. ^ a b Roden 2008, pp. 42–46. ^ a b Nock 1984, pp. 86–87. ^ Roden 2008, p. 46. ^ Nock 1984, p. 87. ^ a b Nock 1984, pp. 224–239. ^ Nock 1984, p. 229. ^ a b c Nock 1984, p. 173. ^ a b Baker 2010, p. 125. ^ Baker 2010, pp. 75 and 125. ^ Bradley 1984, p. 14. ^ Nock 1984, pp. 176–179. ^ Riemsdijk 1997, pp. 106–107. ^ Cox 1973, Chapter 2. ^ Nock 1984, p. 176. ^ a b Hoole 1983, p. 48. ^ a b Talbot 2011, p. 83, Plates 117–118. ^ "LMS Route: Rugby to Tamworth Polesworth Station: lnwr_pol1210". WarwickshireRailways. Retrieved 7 November 2016. ^ a b Earnshaw 1991, p. 30. ^ Vaughan 1989, pp. 18–19. ^ a b Trevena 1980, p. 45. ^ Rolt & Kichenside 1982, p. 288. ^ a b Earnshaw 1991, p. 34. ^ a b Bond 1975, p. 136. ^ a b c d e f Webb 2005, pp. 20–27. ^ a b Roden 2008, p. 108. ^ Roden 2008, pp. 110. ^ Jenkinson 1982, Plates 160 and 198. ^ Jenkinson 1982, Plates 11 and 123. ^ Jenkinson 1982, Plates 26,81,95, 100,145 and 201. ^ a b Roden 2008, p. 113. ^ Roden 2008, p. 112. ^ Roden 2008, pp. 114–115. ^ a b Hands 1980, pp. 28 and 30. ^ a b Roden 2008, p. 120. ^ Roden 2008, p. 140. ^ Roden 2008, p. 141. ^ a b Roden 2008, p. 142. ^ Roden 2008, p. 149. ^ Roden 2008, p. 218. ^ Roden 2008, pp. 221–223. ^ "Duchess of Hamilton locomotive arrives at National Railway Museum in York". The Press, York. Retrieved 26 October 2016. ^ a b "LMS(R) Steam Locomotive with Tender 'Duchess of Hamilton' 4-6-2 Coronation Class, No 6229, 1938". National Railway Museum. Retrieved 26 October 2016. ^ Jenkinson 1982, Plate 70. ^ Roden 2008, pp. 132–135. ^ Roden 2008, pp. 137–138. ^ Roden 2008, p. 157. ^ Roden 2008, pp. 157–158. ^ Roden 2008, pp. 158–162. ^ Roden 2008, pp. 166–177. ^ Roden 2008, pp. 203–207 and 215–217. ^ "Midland Railway's 'Royal' steam locomotive can ride again". BBC News - Derbyshire. 3 March 2012. ^ a b "PMR Tours". Princess Royal Class Locomotive Trust. Retrieved 26 October 2016. ^ "Locomotives". Princess Royal Class Locomotive Trust. Retrieved 26 October 2016. ^ Talbot 2011, p. 101, Plate 151. ^ Roden 2008, pp. 122–127. ^ "Award-winning science museum for fun-packed family days out". Background of Spitfire photograph: Thinktank. Retrieved 16 September 2017. ^ a b Roden 2008, pp. 227–230. ^ Baker 2010, pp. 59, 76–200. ^ a b c Hunt et al. 2008, p. 166. ^ Jenkinson 1982, Plates 85–88. ^ Nock 1984, p. 179. ^ Roden 2008, pp. 98–99. ^ "Photograph of nameplate and numberplate". Flickr. 22 July 2014. ^ Baker 2010, p. 172. ^ a b Roden 2008, pp. 99–100. ^ Roden 2008, p. 68. ^ Roden 2008, p. 72. Baker, Allan C. (2010) . The Book of the Coronation Pacifics Mk2. Clophill: Irwell Press. ISBN 978-1-906919-17-7. Banks, Chris (1990). British Railways Locomotives 1948. Yeovil: Oxford Publishing Co. ISBN 0-86093-466-7. Bellwood, John E.; Jenkinson, David (May 1976). Gresley and Stanier: A Centenary Tribute. London: Her Majesty's Stationery Office. ISBN 0-11-290253-7. Binns, Donald (1988). LMS Locomotives at Work - 2, Coronation Class 4-6-2. Skipton: Wyvern Publications. ISBN 0-907941-32-X. Bond, R.C. (1975). Lifetime with Locomotives. Norwich: Goose & Son Publishers. ISBN 0-900404-30-2. Bradley, Rodger P. (1984). The Standard Locomotives of British Railways. Newton Abbott: David & Charles. ISBN 0-7153-8384-1. Cox, E.S. (1973) . British Railways Standard Steam Locomotives (2nd ed.). London: Ian Allan. ISBN 0-7110-0449-8. Dunn, J.M. (1966). Reflections on a Railway Career LNWR to BR. London: Ian Allan. Earnshaw, Alan (1991). Trains in Trouble: Vol. 7. Penryn: Atlantic Books. ISBN 0-906899-50-8. Evans, Martin (1961). Pacific Steam: the British Pacific Locomotive. London: Percival Marshall. Hands, P.B. (1980). What Happened to Steam, Volume Seven. Solihull: P. B. Hands. Haresnape, Ken (1974) . Stanier Locomotives. Shepperton: Ian Allan. ISBN 0-7110-0108-1. Haresnape, Brian (1989). Railway Liveries 1923–1947. Shepperton: Ian Allan. ISBN 0-7110-1829-4. Hollingsworth, Brian (1982). The illustrated Encyclopaedia of the World's Steam Passenger Locomotives. London: Salamander Books. ISBN 0-86101-106-6. Hoole, Ken (1983). Trains in Trouble: Vol. 4. Redruth: Atlantic Books. ISBN 0-906899-07-9. Howlett, Peter (July 1994). "Resource allocation in wartime Britain: The case of steel, 1939–45". Journal of Contemporary History. 29 (3). Hunt, David; Jennison, John; Meanley, Bob; James, Fred; Essery, Bob (2008). LMS Locomotive Profiles, No. 11 - The 'Coronation' Class Pacifics. Didcot: Wild Swan. ISBN 978-1-905184-46-0. Jackson, Tanya (2013). British Railways: The Nation's Railway. Stroud: The History Press. ISBN 978-0-7524-9742-6. Jenkinson, David (1982). Profile of the Duchesses. Oxford: Oxford Publishing Company. ISBN 0-86093-176-5. Jennison, John; Meanley, Bob; Essery, Bob; James, Fred; Hunt, David (2009). Pictorial Supplement to LMS Locomotive Profile No. 11 - The 'Coronation' Pacifics. Didcot: Wild Swan. ISBN 978-1-905184-62-0. Marsh, Phil (February 2006). Pigott, Nick, ed. "Stanier did not like streamlined locos!". The Railway Magazine. Vol. 152 no. 1258. London: IPC Media. ISSN 0033-8923. Nock, O.S. (1971). Speed Records on British Railways. Newton Abbot: David & Charles. ISBN 0-7153-5342-X. Nock, O.S. (1984). British Locomotives of the 20th Century, Volume 2 1930-1960. Cambridge: Patrick Stephens. ISBN 0-85059-596-7. Peacock, D. W. (1951). "Railway wind tunnel work". Journal of the Institution of Locomotive Engineers. 41. Riemsdijk, J.T. van (Feb 1997). Blakemore, Michael, ed. "LMS, T.F. Coleman and locomotives". Backtrack. Vol. 11. Penryn: Atlantic Transport Publishers. ISSN 0955-5382. Roden, Andrew (2008). The Duchesses: The Story of Britain's Ultimate Steam Locomotives. London: Aurum Press. ISBN 1-84513-369-2. Rolt, L.T.C (1955). Red for Danger (1st ed.). London: The Bodley Head. Rolt, L.T.C. ; Kichenside, Geoffrey M. (1982) . Red for Danger (4th ed.). Newton Abbot: David & Charles. ISBN 0-7153-8362-0. Talbot, Edward (2002). 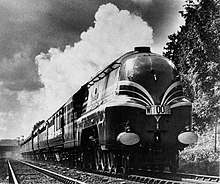 The Coronation Scot, The Streamline Era on the LMS. Stafford: Edward Talbot. ISBN 0-9542787-1-2. Talbot, Edward (2011). LMS POWER, The 'Coronation' Class. Stafford: Edward Talbot. ISBN 978-0-9542787-5-5. Trevena, Arthur (1980). Trains in Trouble. Vol. 1. Redruth: Atlantic Books. ISBN 0-906899-01-X. Tuplin, W.A. (1969). British Steam since 1900. London: Pan Books. ISBN 0-330-02721-2. "Tender of L.M.S. "Coronation" class locomotive". The Engineer. 168. 1939. Vaughan, Adrian (1989). Obstruction Danger. Wellingborough: Patrick Stephens. ISBN 1-85260-055-1. Webb, Terry (May 2005). "'Duchesses' in distress". Steam World. No. 215. Peterborough: Steam World Publishing. ISSN 0959-0897. Doherty, Douglas (1973). The LMS Duchesses. Hemel Hempstead: Model and Allied Publications. ISBN 0-85242-325-X. Jenkinson, David (1980). The Power of the Duchesses. Oxford: Oxford Publishing Company. ISBN 0-86093-063-7. Longworth, Hugh. British Railway Steam Locomotives 1948–1968. Oxford Publishing Company. ISBN 0-86093-593-0. Mannion, Roger J. (1996). The Duchess, Stanier's Masterpiece. Stroud: Sutton Publishing. ISBN 0-7509-0903-X. Powell, A.J. (1991). Stanier Locomotive Classes. Shepperton: Ian Allan. ISBN 0-7110-1962-2. Powell, A.J. (1986). Stanier Pacifics at Work. Shepperton: Ian Allan. ISBN 0-7110-1534-1. Rowledge, J.W.P. (1975). Engines of the LMS, built 1923–51. Oxford: Oxford Publishing Company. ISBN 0-902888-59-5. Rowledge, J.W.P. (1987). LMS Pacifics. Newton Abbot: David & Charles. ISBN 0-7153-8776-6. Sixsmith, Ian (1998). The Book of the Coronation Pacifics. Clophill: Irwell Press. ISBN 1-871608-94-5. Wikimedia Commons has media related to LMS Princess Coronation Class. This page was last edited on 11 March 2019, at 14:30 (UTC).